A faint 22 degree radius ring around the Sun with various brighter areas left, right and on top. The spots on the left and right are sundogs (a.k.a. mock suns or parhelia). The luminous V-shaped light that touches the 22° halo directly above the Sun, is the upper tangent arc. 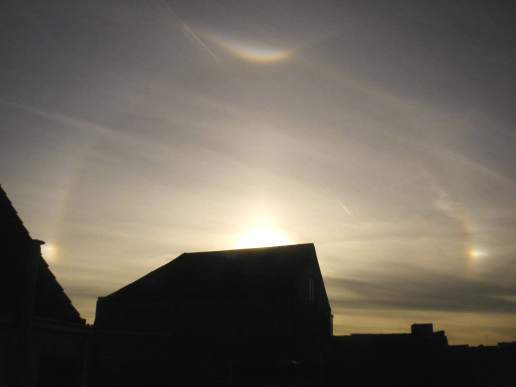 Halo phenomena like these are caused by sunlight reflecting and refracting off hexagonal, column-shaped ice crystals in high cirrostratus clouds. This particular display appeared over Antwerp, Belgium, on August 26, 2004. It remained visible from 7 to 7:20 pm. Photo taken with an Olympus digital camera (model C200Z). Exposure time was 1/800 seconds with aperture set at f/4.4. The photo was taken through coated glass (sun glasses) with an ISO of 100. The next two images show the display in more detail.